A timeless dish, loved by all for its versatility. Basil is lovely in place of the chives, as would be parsley or thyme. 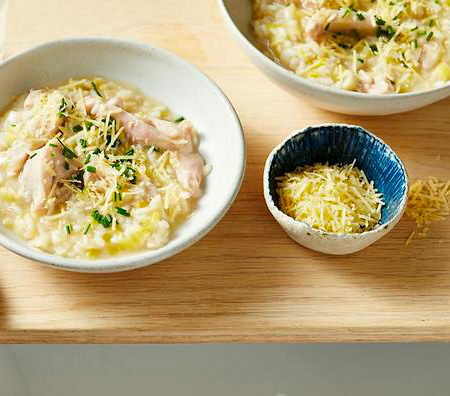 But whatever you do, don’t skimp on the Perfect Italiano parmesan – its sweet-salty richness adds flavour to a risotto as no other ingredient can. Place the stock in a large saucepan and bring to a simmer. Cover the pan with a lid, reduce the heat to low and keep the stock hot. Add the leek and cook, stirring occasionally, for 5 minutes or until softened. Add the rice and stir for 2 minutes or until the rice is hot. Add the wine and cook, stirring, for 3-4 minutes or until the wine has evaporated. Add the lemon juice and a cup of the hot stock and cook, stirring constantly, for about 5 minutes or until the liquid is absorbed. Add the chicken and another cup of stock and cook, stirring, for another 5 minutes or until the liquid is absorbed. Continue adding stock, a cupful at a time and stirring until it is absorbed, until all the stock is used, the rice is al dente and the chicken is cooked through. Add a little more stock, or water, if necessary – the mixture should be thick and creamy. Stir in the lemon rind and Perfect Italiano parmesan and season to taste with sea salt and freshly ground black pepper. Divide among bowls and serve with extra parmesan and the lemon wedges on the side. Recipe and image courtesy of SBS Food.